Moving right along, today we'll have a closer look at the Troops, the Dedicated Transports and those Elite units! All used pictures belong to Games Workshop! 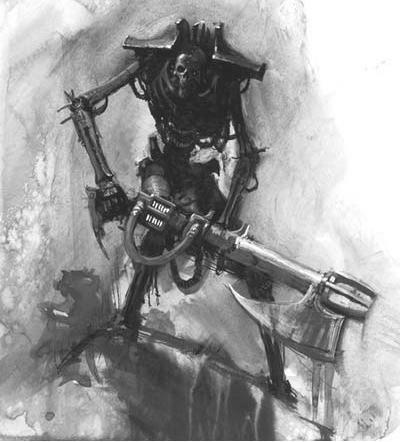 Your mainstream infantry unit that has the standard Necron strengths (durable, Resurrection Protocols & Gauss weaponry) and weaknesses (poor combat skills & low Initiative), has no upgrades available to them, but can take two different Dedicated Transports. As long as you keep their shortcoming in mind, these mechanical husks will serve you well. A big step forward from the last codex is that you no longer need a minimum of 10 for a unit, as of now you can start out at 5 – while expanding up to 20 Warriors in a single unit. Gauss Blaster, Tesla Carbine, Gauss Blaster, Tesla Carbine……you’ll be spending quite a bit of time doubting which to use and to be entirely honest I haven’t figured it out a 100% myself. Their weapon load out, in my opinion, truly depends on the role you want them to play and the support units that tag along with them. The Tesla Carbine keeps your Immortals more mobile and are great for taking out low armour save infantry. Gauss Blasters on the other hand are better at knocking out heavier infantry and, when placed correctly, a volley of Rapid Fire Gauss Blasters can do some serious damage. In between the Phaeron trick (see below), Deep Striking, Monolith use and the Veil of Darkness you should have plenty of opportunity to get that perfect volley in. - When fielding Anrakyr you get to upgrade one unit of Immortals to Pyrrhian Eternals for free, giving one unit Furious Charge and Counter-attack for free. Considering the general Necron weakness in close combat the extra attack when assaulted can really surprise your opponent. 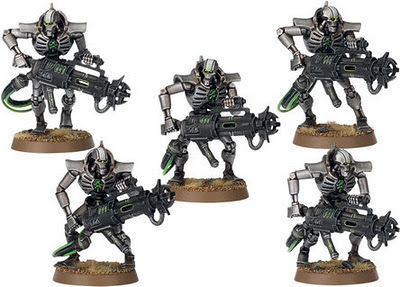 The Furious Charge is a nice bonus, though in general I suspect Necrons will be on the receiving end of most assaults. Hobby tip - Plan on using multiple Crypteks and some Immortals? Then don't forget those nice Deathmark heads you'll have leftover from this plastic kit. 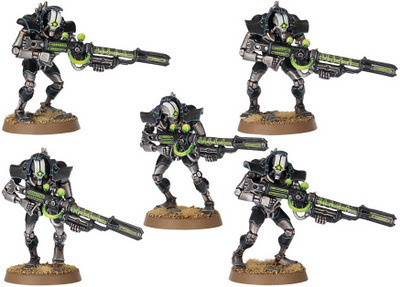 Even when combined with a simple Warrior body and a plastic rod with a spare Necron ornament glued on top you will be able to create five Crypteks easily and a lot cheaper than the Finecast version. Though I definitely have to admit that the Finecast version is a very nice sculpted miniature as well! The Command Barge can be used by an Overlord and all of the Special Character Overlords (Imhotekh, Zahndrekh, Anrakyr & Trazyn) and combines some nice weaponry (Tesla Cannon or Gauss Cannon), decent defense thanks to the Quantum Shielding, the ability for the rider to transfer his wounds for repair purposes and, most useful of all, the Sweep Attack rule. The Barge gets to make 3 special attacks on a single target it moved over in the Movement turn using its Overlord’s / Special Character’s strength value combined with any bonus they may receive from special weapons (woohoo Warscythe!) with to hit of 3+ and to wound of 4+. There are no saves allowed against these Sweep Attacks and on a to hit roll of 6 the Barge even gets to pick which specific target gets hit. In between a cheap Overlord with a Warscythe and the Command Barge I think we have a very nice and mobile tank hunting unit that can potentially take out two vehicles in a single turn at only 180 points. 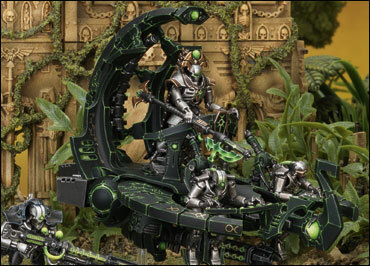 This transport can only be used by Necron Warriors, though of course all types of Overlord and Court members can join a unit in an Ark. This vehicle serves a dual purpose, first it is an open-topped, skimmer transport that can carry up to 10 Warriors. More importantly a Ghost Ark can resurrect up to 3 Warriors of a single unit within 6” every turn (strengthening the unit up till its starting numbers). As you can imagine this ranged resurrection power makes an Ark a very useful addition to a strong line of Warriors. In addition it also has Quantum Shielding, so it will survive a while against some of the current mid-level anti-armour weaponry like the missile launcher. Finally we have the Ark’s weaponry – the Gauss Flayer arrays, which consist of two arrays each with 5 Flayers that can both be fired at a different target. Though I certainly wouldn’t advise using a Ghost Ark solely as a mobile weapon platform, its ability to fire at two unit with Gauss weaponry can tip the balance if used as at the right time. 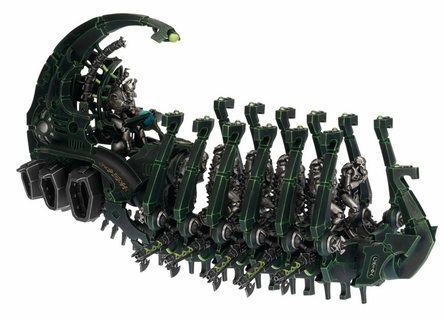 The Night Scythe doesn’t have the durability of the other Necron Vehicles with only AV 11 and no Quantum Shielding, at the same time though we have a vehicle that can carry up to 15 models (including Jump Infantry who count as two models) that get moved to Reserve if the Scythe goes down, can move at cruising speed and still fire all weapon, can flat out up to 36” and has a twin-linked Tesla Destructor that is capable of doing considerable damage to multiple units as its electric discharges arc from unit to unit. Quite frankly I love this unit, despite its lower defenses it has so much potential for both destruction and added maneuverability at a very fair cost! Given that the Elites section of the book doesn’t have a lot of truly competitive stuff, these guys are quite interesting for 95 points. They are in essence assassins with short ranged, sniper weaponry that can Deep Strike, including right after an enemy reserve unit arrived on the table. 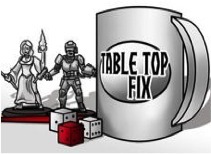 Right now this doesn’t make much sense, but like many people I think this is a hint at the new edition rules rumored to arrive next year in 6th edition. Rumors at the moment point in the direction of reactive shooting and action in general, pretty much taking a some elements from the awesome game of Infinity. Time will tell if this is true, but quite frankly a change in the rules is the only thing that will make sense of this Deathmark ability. Unfortunately, to get the maximum out of these guys you will need two squads as each squad also is allowed to mark an enemy unit that a fellow Deathmark unit will wound on 2+. Though the Deathmarks definitely will do some damage, their short range and general inability at combat will make them a sacrificial unit most of the time. Pretty tough bodyguards armed with Warscythes (power weapons with +2 Strength and 2D6 armour penetration) that cost a whopping 40 points apiece and come at a unit minimal of five and thus 200 points. They also have the option to take Hyperphase Swords and Dispersion Shields instead, which in my opinion is the only way to wield these guys. They only have a single wound on their profile, so you will need that invulnerable save provided by the shield (the bouncing of shooting attacks is a nice gimmick, but won’t see much use). But even then I don’t see much of a role for them, especially given that you only get two attacks on their profile (especially since I doubt these guys will be doing much assaulting). Too expensive, not good enough as bodyguards or vehicle hunters, yet still so cool looking. True shame these! They can be made more reliable and tough by adding an (Over)Lord, a Resurrection Orb and maybe a Cryptek, but that just turns them into an even bigger point sinkhole that focuses on mediocre close combat speedbumping. A Cryptek from the Harbingers of Storms would definitely be at home supporting these guys though! These have me utterly stumped, I have no clue what Matthew Ward had in mind when he made up the rules for these minis. What we have here is another 40 point infantry model that only has 1 attack on its profile, is Fearless and jump infantry. Their standard weaponry is a very short-ranged 6” Strength 5, AP 2 assault shot, though they can also replace these Rod of Covenant for Voidblades and Particle Casters. The Void Blade gives them Rending and Entropic strikes, while the caster is a short-ranged pistol that gives them a much needed +1 attack in close combat. In their standard configuration the Praetorians are only suitable for two roles, either as a counter-attack unit or for taking out Terminators (or infantry with that level of armour save). Given their Fearless nature they NEED to win a combat or they will get crushed very soon and quite frankly they’re not good at combat at all. With Voidblades and Particle Casters they could be used to go after vehicles, marines squads and multi-wound units, but they remain way too expensive to be considered a reliable choice that can make back their 200-400 point investment cost. It truly pains me see both units included in this boxed, plastic set turning out to be, well…duds. Point for point there are literally a dozen dedicated assault units in other codices that for the same 200-450 points will chew both these units up in 1-2 turns. -Writhing Worldscape – turn normal terrain into dangerous terrain, while dangerous terrain becomes even more hazardous. Try and hide in forest or ruins now! - Swarm of Spirit Dust – assault, defensive grenades and stealth. - Transdimensional Thunderbolt – nice anti-armour shot. - Time’s Arrow – when combined with a Canoptek Wraith with a Whip Coil that reduced an enemy’s Initiative to 1, picking and forcing an enemy to take an Initiative test or being removed becomes mighty scary! 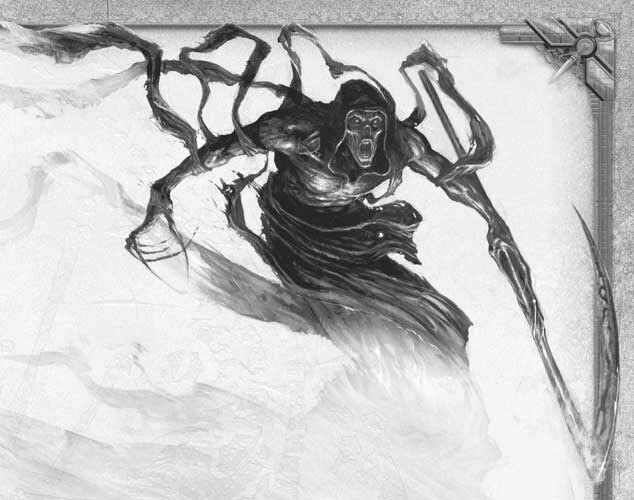 Combine that with the Wraiths’ great close combat abilities (see below) this guy can do some major assault-based damage. - Gaze of Death & Transdimensional Thunderbolt (Etheric Tempest cannot be replicated with the current rules). Though their Initiative of 2 is going to hurt them in combat, their Strength 4, Deep Strike, Infiltrate, Reanimation Protocols and 3 profile attacks make these bots quite a steal at 13 points. Even a small unit of five Flayers will only set you back 65 points, will slow down your enemies for 1 or more turns and given the low number of interesting units in the Elites section taking a unit of these guys won’t rob you of a precious slot. For those using or facing Imhotekh the Stormlord don’t forget he has Bloodswarm Nanoscarabs that allows him to mark an enemy unit and all Deep Striking Flayers within 6” will not scatter. Given the rumors of Deep Strike and assault changes in 6th edition these guys may be seeing a lot of use! The Stalker is a Walker that Moves Through Cover, has an interesting Heat Ray weapon that can be fired as a Heavy 2 Melta or as a template weapon. In addition if the Stalker manages to hit an enemy unit all other friendly units shooting at that unit in the same turn count their weapons as twin-linked. It can exchange its weapon for the rather nasty Particle Shredder (huzzahs for large blast weapons and potentially hitting + marking multiple units!) or a twin-linked Heavy Gauss Cannon (great to have a 36” range weapon, shame it is wasted on a Stalker). The Triarch Stalker could be very useful, but it also requires supporting units. If left to its own devices, all it will take to pin those 150 points down is a small group of Space Marine Scouts or Ork Kommandos. And it’s not like the Stalker will be able to fight them off, after all it isn’t a Monstrous Creature. This may actually be one of these situations in which a small unit of Flayers can come in quite handy! 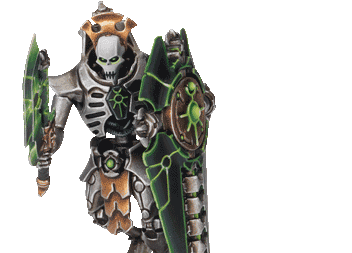 The Stalker suffers from the same ailment as many of the Necron units in this new codex – tons of potential, high point cost and mostly dependent on your opponent’s choices whether or not it full fulfill its potential. And that does it for today, up tomorrow – Fast Attack & Heavy Support. Thanks for reading, hope it is of use to the Blogsphere out there and let me know if you have any questions!